Choose a combo or build your own professional chess set with the best equipment on the market. Not every chess set is suited for use in tournament style play. 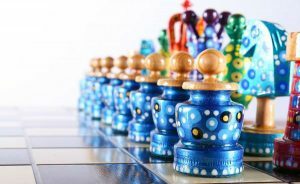 Just take one look at the wide variety of chess set styles and themes are available, and it will be easy to see why. How do you adjudicate a mistake one player made as a result of confusing one amorphous blob shaped piece with a different one that’s similarly shaped? It would cause a major headache for tournament organizers. It’s easiest just to stick to one traditional style of chess set that everyone is expected to be familiar with. Many times, when you enter a chess tournament, you’ll be required to bring your own chess set with you. It’s important to make sure that your set meets the tournament’s requirements, or else you may be turned away at the door and disqualified before you even get to play! No one wants that. The main requirement for tournament chess sets are size related. The board you use must have 2 ¼ inch squares, and the King piece must be between 3 ¾ and 4 ¼ inches tall. 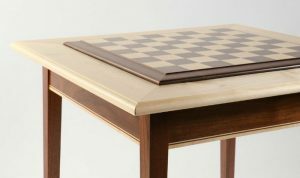 This size is a bit larger than the typical size for a home chess set, but it makes things run smoother in the demanding tournament environment. Chessmen must be made of wood or plastic, and it’s absolutely critical that they be closely modelled after the Staunton pattern to avoid confusion. This tournament chess set from The House of Staunton allows for a little personalization and self expression even within the rigid rules concerning tournament ready chess equipment. 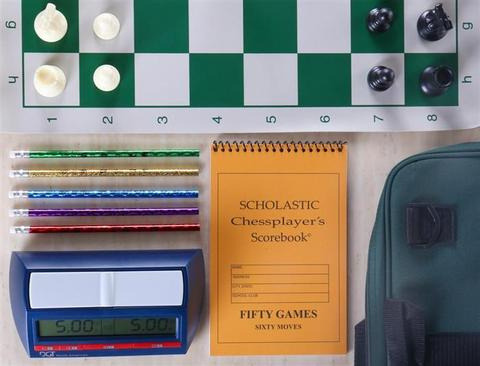 You can select the board, pieces, clock, and scoreboard that you like the best and design your own personalized, professional chess set that is 100% tournament ready. This Deluxe Tournament Combo Set even comes with a carrying case to help you transport everything safely to and from tournaments! Depending on the choices that you select, the price of this tournament chess set can go up or down, making it perfect for people who want to get a high quality professional chess set while still controlling their own budget. 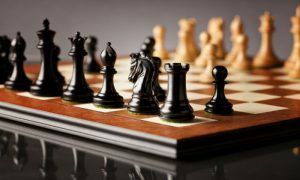 If money is no object, you may choose to get the very best of everything and design a top of the line chess set that may well become the talk of the tournament. 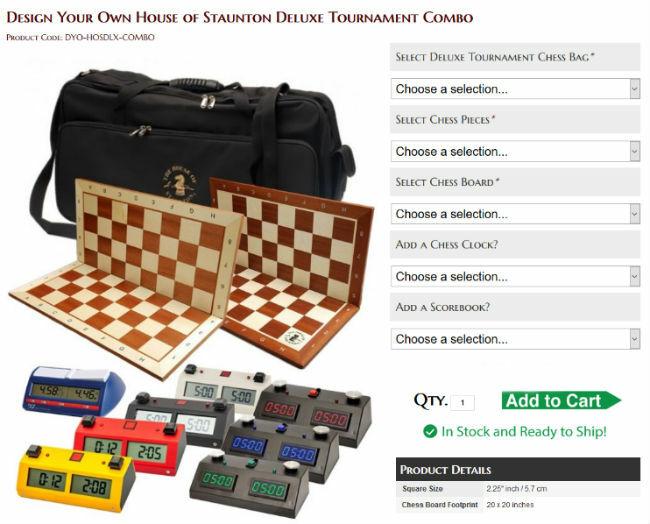 All of the products available in this chess tournament set except for the chess clocks are manufactured by The House of Staunton, one of the leading names in luxury chess sets, so you know they have to be good! 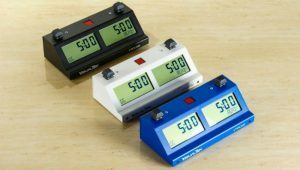 For chess clocks, you can choose models made by Chronos, DGT, and ZMart, all of which are trusted brands. 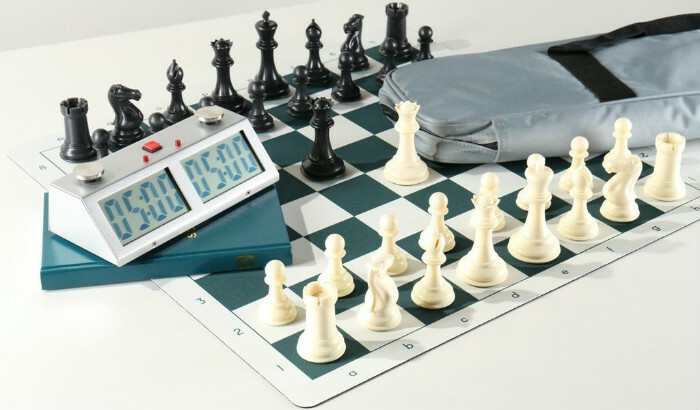 This chess set, with its roll up silicon tournament chess board, is more typical of what you will see in professional chess. Look over the tables at any chess tournament and you’ll see that the roll up chess board is the board of choice for most players. This is due to its convenience as well as its affordability. Roll up tournament chess boards take up very little space in a bag, and they’re cheap enough that you can keep one at home, one in the office, and one in your car just in case you’re ever in need of it. They’re beloved by beginners and professional chess players alike. This board offers an improvement over the typical vinyl model, since it’s made of silicon that is heavier than vinyl and much more flexible. It will not become brittle or crack over time, and it should last you many years. If you’re not someone who needs to make a splash with a fancy tournament chess set, The Silver Slate Pro Chess Set Combo is the dependable and affordable set for you. It does its job and it does it well, you can always count on the durability of the heavyweight silicon board and its weighted plastic tournament chess pieces. 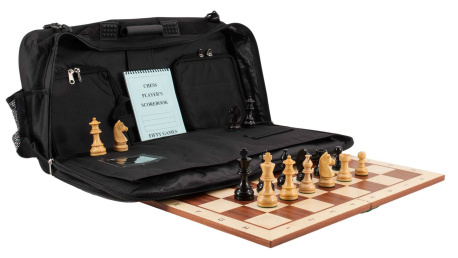 The scratch resistant metal case of the ZMF Pro chess clock included with this set won’t break on you either, and the padded bag designed to protect and carry all these things is built to last as well. This set is a great investment for someone looking to get into tournament chess at any level. If you have any desire to play tournament style chess, you’re going to need a regulation tournament chess set. There’s just no way around that. 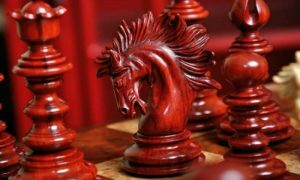 The good news is that high quality tournament chess sets can be found at an affordable price point, and they will last forever with proper care. 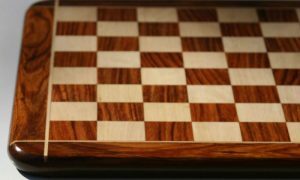 If you’re more concerned with style than price, there are also tournament chess boards that will work for you. The House of Staunton’s customizable chess combo offers many different styles and colors so you can craft your ideal tournament chess set. Tournament chess sets aren’t just for tournaments, of course. They can also come in handy for use in informal chess clubs or when hanging out with your friends. Any time you could use a regular chess set, you can use a weighted tournament chess set. Unfortunately, the reverse is not true, so if you’re only going to own one chess set, and you have any interest at all in one day entering tournaments, you had better buy a professional chess set that meets tournament regulations. If you’d rather own only one chess set, or your budget is such that you can only afford to buy one, there’s no reason why a regulation tournament chess set couldn’t also function as your main chess set. They are durable enough to stand up to the heavy use, and many of them are quite stylish. 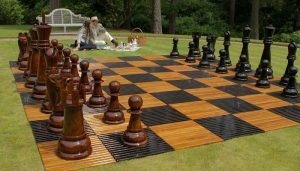 The only issue that you may run into is their large size – tournament chess sets are typically a bit bigger than regular home models, so you may have a difficult time finding an appropriate place for it. To sum up, if you can only own one chess set, it’s better to make it a tournament ready professional chess set. There are plenty of models available, but the ones on our list are the best 2019 has to offer in terms of durability, affordability, and style.